Over the past few months Twitter has continued to impress by breaking news faster than any other medium. Beyond spreading the news of things like Beyonce’s pregnancy and Kardashian weddings, countless animals have been saved by people sharing their stories on Twitter. Just a few months ago hundreds of people walked the streets of Halifax after finding out on Twitter that newly rescued Greyhound Bella had run away. Tweet by tweet we stayed connected on our search through Twitter and cheered as Bella was returned to safety. 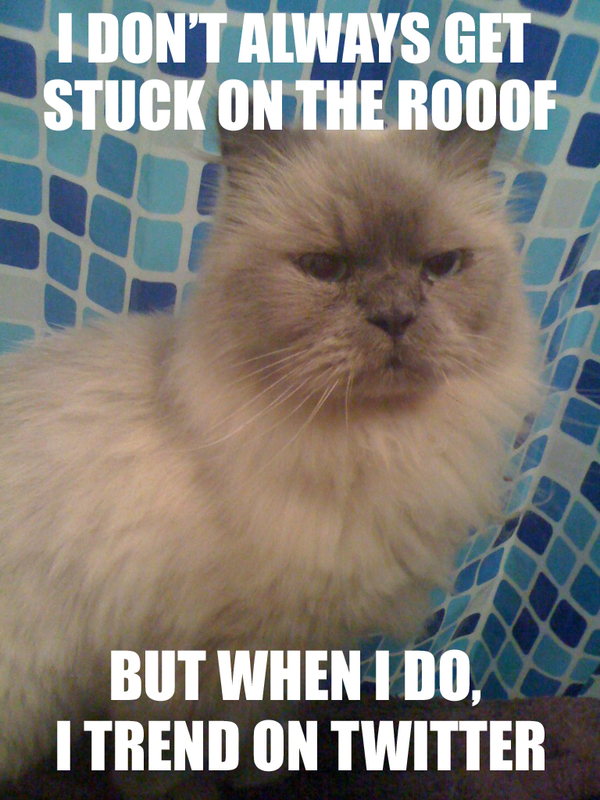 Thursday night around 4pm I caught wind of some action on Twitter talking about a cat in distress who was stuck on a roof and couldn’t seem to get down. The thing that really struck me was that the person behind the tweets, Seth Graham aka @brinkofink, wasn’t even the owner of the cat, just a good neighbour who had noticed that the cat had been stuck up there for quite some time. Seth’s concern was growing as the day was getting hotter and the black shingled roof was no place for a cat to be – especially without any food or water. The tweets kept coming and before I knew it my Twitter feed was full of people trying to figure out what to do to help Seth save this cat that none of us even knew. The problem was that beyond being stuck on the roof of an apartment building, the roof was incredibly steep making it un-climbable for someone with just a ladder and no proper equipment. Soon Boneheads BBQ in Halifax stepped up and had a truck with a lift brought to the building. Our hopes all climbed and were quickly dashed as we learned that the lift couldn’t go to the roof because of power lines that were in the way. Hour after hour, tweet after tweet people rallied together to try and get this scared and potentially dying cat off the roof. Oddly enough, the SPCA and Animal Control wouldn’t or couldn’t help. The Fire Department was unable to assist as they need to be on call in case another more urgent situation were to present itself. Bonehead - safe and sound with Seth Graham. Kudos to Nick Calder for the sweet and timely photoshop! was trending and people from all over the place were making calls, finding equipment and the right people to help. As it got darker outside it became more dangerous to get Bonehead down, and the hope that the cat would be saved was quickly disappearing. But just as things were looking grim, Boneheads BBQ struck again, asking Five Star Roofing to try and help. Around 9pm, two men bravely scaled the roof in the dark coaxing a very scared cat into a carrying bag and bringing him down to safety. Within moments of Seth announcing Bonehead’s exciting rescue hundreds of tweets came flooding in – obviously people who had been glued to Seth’s live tweets all night. Once safely inside, Bonehead took in some much needed water and TLC. We are unsure of who Bonehead belongs to, but should he be a stray Seth has lovingly agreed to take in his new friend. Without the incredible kindness of Seth Graham, and some amazing people on Twitter who knows what might have happened to this poor little cat! Yay Seth!! Yay Bonehead’s!! and Yay 5 Star Roofing!! It warms my heart to know that some people still care. Five Star Roofing and Boneheads – I’m spending my money with YOU! Congratulations to everyone involved for helping get Bonehead off the roof. He’s a gorgeous kitty! Hopefully his future doesn’t have any more crazy adventures, just the of love and safety of a good home.